Its been since February since we put up a post but a lot has happened since then! I have just added an instagram widget which you can see on the right of the screen. I take a couple of photos and videos a week, mostly when I go outside and have a “wow” moment. The scenery here is always changing and really beautiful around sunrise and sunset. So you will find plenty of photos to see what we have been up to lately there. This summer we took the roof off the building and insulated with 15cm of polystyrene. We went for polystyrene over something more “eco” because of the cost. Our sustainable ethics can only stretch as far as our budget and we have maximized the use of natural building materials elsewhere. Also for the same price we would have only been able to insulate with 5 cm of natural cork instead of 15cm, and polystyrene has much better insulation qualities at the same thickness than natural cork. We noticed a difference straight away in how cool the house was over the summer. If we closed all of the windows in the morning while the house was cool, it stayed that way all day. We have just finished plastering the outside of the building. We chose to go with an insulated lime, cork and diatomaceous earth plaster at about 1.5cm thickness. This is really a minimum, but we think that with the roof being well insulated and the fireplace, we will make it just fine through the winter using a minimum of wood. At the moment the temperature is about 9 degrees C in the mornings and the house is staying at around 19 – 20 degrees C even with the windows open. The house looks great! And that is one of the major jobs we had left that is finished. The lime plaster for the finish coats is made locally and the company that makes it have been very helpful with recommending good workmen for applying lime. It is also great to be able to support a local company that make sustainable building materials. We now have just the final coat on a couple of walls on the inside of the building and a bathroom to finish, and that will be all of the big stuff done! This week I have been digging trenches for the cables to the solar panels. Today I have to dig some holes for the foundation of the solar panel structure which is arriving next week. After the solar panel structure is built, we will order the rest of the solar panels and the batteries and install our big system. I often put up videos on our youtube channel and dont update the blog so you can get small updates there and on the instagram feed. We have been hard at work even though the blog has been quiet. Building a house with no previous experience is a lot of hard work, both physically and mentally. You spend long hard days doing physical labour and then when you get home its time to get stuck into books, internet and youtube to figure out what comes next and how you are going to do it. Its one long learning process. My initial idea for the blog was that I was going to do more “how to” videos and quickly realised that this wasn’t going to be possible. Its too difficult to film, edit, upload while you also have to learn to build and build. The filming tends to get in the way. I shoot mainly on a small point and shoot camera and so cant just set it up and leave it filming while I get on with it. That wouldn’t be all that interesting anyway and would mean hours of sorting through footage and editing which I just don’t have the energy for. I have been filming bits and bobs as I go along and am now going to make an effort to try and post an update every week or two. When most of the building is complete I have the intention to make some more in detail write ups and videos on our building process. So what has been going on at Ca’n Mandala? We have almost all of the walls finished with a base coat. The only room left to do base coats on is the master bathroom which has been our bedroom up until now. That bathroom will be the last room to get finished as we are currently working on the smaller guest bathroom so that we can get in this winter. As we aren’t going to be able to insulate and finish the outside of the building this winter we decided to do an insulated lime plaster on the north walls of the house. In the winter, this will keep the heat in the house and the cold out. I will upload a video on that some time soon. We have the finish coats done on the big walls in the living room and the kitchen. We got two guys that were recommended to us by the place we get our lime from(Unicmall) to do the big walls and they did an excellent job! On the second floor where we have done the insulated plaster, we have decided that in order to get in sooner we would just lime wash the base coat. We might apply a finish coat later on when most of the more important things have been done. We have also done a finish coat in the bedroom where the wardrobe will be. This was a test to see how this fine finish coat would go on. Unfortunately we started doing this just when it started to get really hot. Lime plaster needs to “set” or harden slowly, if it sets too fast then it doesn’t “carbonate” and it just powders off the wall. This is especially true of thin finish coats that are only 1 or 2 mm thick. It was 40 degrees C the day we wanted to do it and so it was setting so fast that it was turning to powder and not letting us polish it. The plaster we had chosen was a type of stucco or polished lime finish, but the conditions made it impossible to finish properly. Luckily, we did do a trial run inside the wardrobe before going on to do this process on one of the main walls in the house. It has actually dried a lot lighter than you see in the pic and doesn’t look bad. Here are some colour tests that we did to choose a colour for a wall in the living room. Last weekend we got the floor tiled in most of the house and it looks amazing! It has really changed everything and being able to live at the finca has suddenly become a reality. With the dirty, dusty lime slab it all seemed a little far away still but now we are getting very close! We have finally covered the water tank and now have a lovely terrace! There have been a few other things going on which I will cover in my next post. If you would like to keep up to date on new videos and posts then please subscribe to our blog and youtube channel. Keep an eye on our youtube channel as I often upload videos there but dont make a post about them here. I will try and write a post every other week and hopefully in the not too distant future I will be able to give a little back to the internet community which has helped me so much along this journey by doing some “how to” videos. If you have any specific questions then please leave them in the comments and I will try to get back to you as soon as I can. After yesterdays video I thought I would make a more specific introduction to Passive Solar design in Google Sketchup. We will finally (after almost two years waiting for paper work to come through) be starting work on our barn conversion next week! We decided that we needed a toilet on the land so that the builders who are coming to demolish the inside don’t leave little presents all over the place for us. I thought that this would be a good opportunity to try out “Light Straw Clay” also known as “Slip Straw” as we want to make the interior walls this way. We dont have any previous experience with this type of building (or any type of building for that matter) so it will be fun and we can get a feel for technique. Light Straw Clay is a system that was originally used in Germany. I really like the sound of it because it looks really easy. All you have to do is make some “clay slip”(clay mixed with water), toss it over some straw like if you were dressing a salad and then pack it into a form. Repeat the process until your wall is finished, leave to dry, remove the forms and presto! You have a wall that is ready for plastering and is well insulated. I have been studying passive solar design for a couple of years now and our composting toile t project is a great excuse to put all of the theory into practise. It will be an exterior loo, so it could get chilly in the winter and probably not the nicest place to be in if its just a dark and sombre outhouse. I have designed it so that the sun will shine in and heat it up in the winter, making it a comfortable, warm and bright place to do your duties. For those of you that are still wondering what Passive Solar Design is; it is basically the use of the heat of the sun shining onto something that will store that heat (mass, normally stone, brick, adobe, etc) to warm a space. 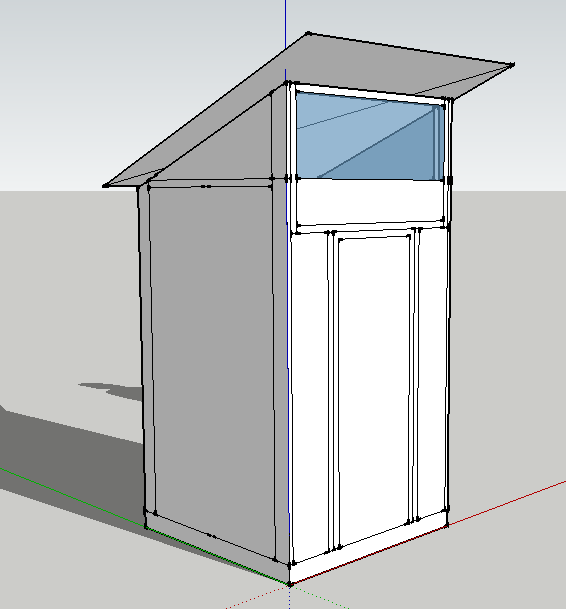 I first designed the porta potty in a program called Google Sketchup as it lets me make a scale model and then place it in the exact virtual geographical location to see how the light and shadows react at different times of day and throughout the year. This is great because it allows you to make changes, try out different configurations until you have something that works. This is the design that I came up with for the shed that will house our composting toilet. Its form is dictated purely by function. The roof is slanted at 21.6 degrees which is the angle of the sun at solar noon on the winter solstice (21st of December) in our region. I have set the roof at that angle so that the sun shines directly inside through the large window at the top giving light and heat which will be captured by the light straw clay and earthen plaster (mass) and then released slowly as night falls. The light straw clay also acts as insulation which will help to maintain the temperatures fairly constant on the inside. The overhang is designed so that as the sun gets higher in the sky (closer to summer) it will stop shining straight in and wont heat the space any more. If I have done everything correctly the space will be warm and bright in the winter and cool and shady in the summer. In my next post I will show you my progress with making the frame. I am hoping that we will be ready for the winter solstice so that I can see if my maths (which is rubbish) is correct and feel the warm sun on my face while depositing a little packet of future fertility for our fruit trees.